Will you join us in urging Congress to fully fund the TIGER Program? Sign our letter by clicking here! We urge your action in restoring funding for the Transportation Investment Generating Economic Recovery (TIGER) discretionary federal grant in the House appropriations process. On September 14, 2017, the House of Representatives passed a $1.2 trillion package of spending bills for Fiscal Year 2018. The package was made up of twelve spending bills, including the Transportation, Housing and Urban Development (THUD) Appropriations bill. The THUD bill included $17.8 billion in discretionary appropriations for U.S. Department of Transportation (DOT), but failed to fund the TIGER. 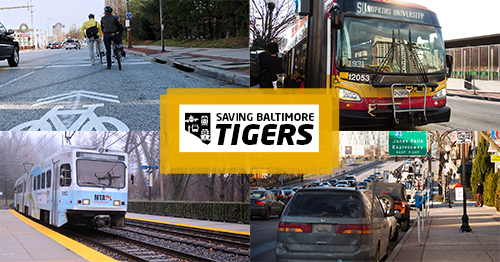 The TIGER discretionary federal grant program supports innovative multi-modal and multi-jurisdictional infrastructure projects that seek to improve access to reliable, safe, and affordable transportation and spur economic development. Since its creation in 2009, the TIGER program has provided over $5 billion to over 400 projects in all 50 states, the District of Columbia and Puerto Rico. Our city and state have greatly benefited from this program. In 2016, DOT awarded the North Avenue Rising project $10,000,000 to fund roadway, signal, and sidewalk improvements along North Avenue, as well as to improve transit options through subway station, bus/bike lane, and light rail improvements. North Avenue is a major east-west corridor in Baltimore city, the second busiest bus corridor in the city, and connects key employment centers to as lower income neighborhoods. Additionally, in 2015, DOT awarded the Southeast Baltimore Port Industry Freight Corridor Plan project $10,000,000 to enhance freight services from the Port of Baltimore and restore Colgate Creek Bridge to functionality. Together, these investments support our desire to see enhanced access and mobility within Baltimore City, while also supporting key employment centers and economic drivers of our region. Unfortunately, this short-sighted decision risks disrupting transformative infrastructure projects around our state that may apply for TIGER funding in the future. This program could support enhanced Amtrak train speeds along the Northeast Corridor, more efficient freight rail operations needed to support the Port of Baltimore, or transit access to the proposed Port Covington project in Baltimore City. We hope you will fight for the TIGER program in upcoming spending negotiations with the Senate.